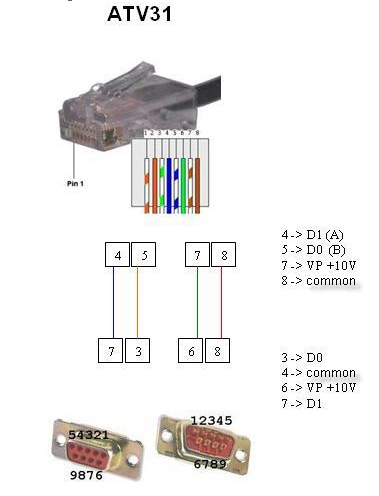 For Modbus communication, the signals used for the ATV31 /312 are D-B and D-A only - the other connections are not used. For CANopen communication, the signals used for the ATV31 / 312 are CAN-H, CAN-L and CAN-GND - the other connections are not used. With the VW3A31101/ VW3A1006/7remote display terminal, the signals used are D-B and D-A as well as the power supply. Caution: Lengths of cables need to be observed as too greater voltage drop in network connections may cause a malfunction.